Waterstones is buying the 115 year-old family-owned chain Foyles, saying the deal will help to "champion" real bookshops in the face of online rivals. 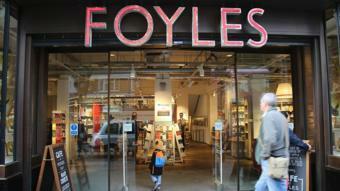 The sale includes Foyles' well-known Charing Cross Road store in central London, which was relocated to larger premises in 2014. Waterstones said the deal would help booksellers fight back against Amazon's "siren call". The larger chain has 283 bookshops across the UK and northern Europe. Foyles was founded at the turn of the last century by the Foyle family and for more than half a century was run by the famously eccentric Christina Foyle. Her approach included sorting the books by publisher rather than alphabetically, and regularly dismissing staff after a year.